Salsa Suprema is a Mexican original, made with Sante Fe chilies, tomatoes and spices. This superb, all-purpose salsa is the same recipe used in homes throughout Mexico. Fresh peppers and premium ingredients make La Vicotria Salsas perfect for cooking - or for a snack. (Or for a snack...while you're cooking). You'll add a bold fresh flavor to all traditional foods such as salsas, tacos, enchiladas, chilaquiles, tamales and stews that is both scrumptious and irresistible. 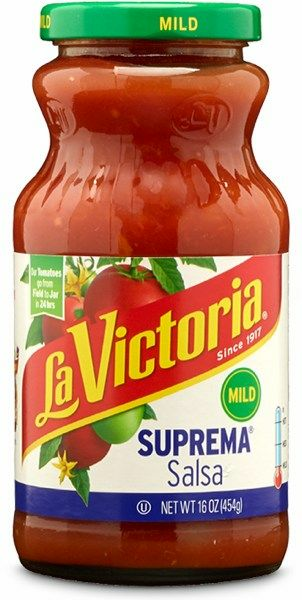 La Victoria is a mild sauce that will add a hint of spicy delicious flavor without overwhelming the dish. Try it now, you won't regret it.Ingredients: tomatoes, tomato puree, bell peppers, onions, salt, santa fe chiles, distilled vinegar, modified food starch and garlic. Salsa Suprema para tacos con jitomates molidos, chiles, cebolla, ajo y cilantro. Salsa taquera La Victoria. Pimientos frescos e ingredientes de calidad hacen de la salsa La Victoria un condimento perfecto mientras cocinas - o para una botana. (O para una botana...mientras cocinas). Le daras un sabor fuerte y fresco a todos los platillos tradicionales que prepares como las salsas, tacos, enchiladas, chilaquiles, tamales, sopas y caldos...que seran tanto riquisimos como irresistibles. La Victoria es una salsa con un picor ligero que le dara un toque de sabor picoso a tus recetas sin ser abrumador. Pruebalo ya, no te arrepentiras!Ingredientes: tomates, pure de tomate, pimientos, cebollas, sal, chiles santa fe, vinagre destilado, almidon modificado y ajo. Been my favorite for 30 years. It's not hot and has no green peppers. I love it. This is a staple in our home during football season. ProsJust the right size jar for a family of two. ConsYour shipping via FedEx stinks. On a previous shipment they dropped the case and broke nine of the twelve jars. This time they only broke two jars. FedEx said to notify you about replacing the two jars. I called you and left a message which you did not return. You or FedEx still owe me two new jars. For my friends who want an authentic taste of Mexican cuisine but are unable to take much heat, this is a grand way to introduce them to a new way to it. Never any regrets with this company and its fine products.